Miniature Maven Diaries: Let's get ready for Christmas! I have Josh Groban's Noel Album on my ipod and really like to listen to it around Christmas. I don't have the energy to put together my Christmas scene or work on any of my miniature project right now, so I decided I would do a favorite things post. 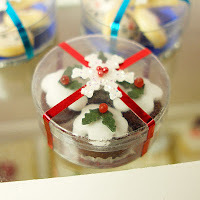 I found this adorable Christmas Pudding Gift Box in sarahmaloney's Doll House Kitchen Etsy shop. This little guy captured my heart! I'm looking forward to Christmas! I hope all my lovely followers are too!